Home › Lambs › The next generation of hard-working farmers starts here! The next generation of hard-working farmers starts here! 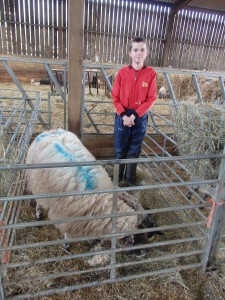 My youngest son, aged 11, was given money as a Christmas present to buy some sheep. However, he had to wait until the Spring markets to buy them. During the recent Easter holidays, which he spent mostly helping his Dad and big brother with the lambing, it was time to spend that money. Dad took him to Holsworthy market and he went around all the pens to choose the best sheep that he could afford. He then had to bid for them against many other farming buyers. 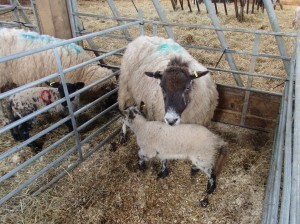 He was very lucky and had 2 ewes, with 1 lamb each at foot, knocked down to him before his money ran out. He and his Dad loaded them up and brought them home. When he came back he told me he had ”now started his farm.” He is very proud and goes out checking them every day. ‹ Cattle in the wrong place can do a great deal of damage!